Package comes with Everything shown from the picture above (color may vary on some items). NOTE: This is a universal Kit. This Kit Will add 50-70+hp at 7 psi. 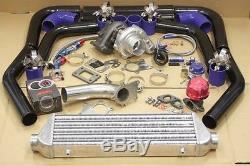 You will need Turbo Manifold to complete the Turbo Kit Project. Item Detail: 100% Brand New Kit, High Quality, Never Been Used or Installed! 1 x T3/T4 Hybrid Turbo Charger: 100% Brand New T3/T4 Hybrid Turbocharger! This turbo can easily do 25 PSI, and 500+ hp on b series swaps, standard t3/t4 flange, perfect for any 4-6 cylinder applications. Power performance output capability = 25-35 psi. High quality t04e with a forged turbine propeller wheel! Turbo Specification: -Inlet Diameter: 3" -Outlet Diameter: 2" -Oil Inlet: 1/8 NPT -Compressor Wheel. 63 A/R Turbine wheel: -Exducer: 2.48" -Mayor: 2.89". Compressor wheel: -Exducer: 2.07" -Mayor: 2.36". 1 x Intercooler: Light Weight. Size 27'' x 7'' x 2.5'' inch. 1 x Universal turbo intercooler piping kit: Made of 6061 aluminum. 2.5 inch diameter piping kit with high quality silicone couplers and T-bolt clamps. The couplers will not split easily + the clamps will not strip like the cheap kind. Strong & tighter fitting use hair spray between the pipe and coupler. Mandrel bend for high flow and high horse power and better turbo response power. 1 x Type-S Blow Off Valve: Brand New, Light Weight, High Quality CNC Billet Aluminum Type RS Style Blow off Valve and 2.5 Inch Type S/Rs Flange Pipe. Easy Mount Piping Set Included For Bolt-On. Our Blow Off Valves Are easily adjustable to prevent both permature boost leakage and compressor surge. 1 x 35/38MM Wastegate: Brand New, High Quality 35/38mm External Waste Gate Kit. The Waste Gate is in accurate boost control and high quality appearance features Dual port design, accurate boost, ultra durable diagram (diaphram). It comes with waste gate spring (fully adjustable, up to 15 psi), allow you to add the spring to get desired high psi. 1 x Turbo Boost Gauge: 2 (52mm) Turbo Boost Meter GaugeDesigned with a Smoked Tinted LenseRed LED Illuminated Needles. Comes with All the Wiring Necessary for InstallationAll Accessories are Included for Installation 1 x Turbo Boost Controller: Brand New, Light Weight, High Quality CNC Billet Aluminum Manual Turbo Boost Controller. Adjustable boost knob increases horsepower and torque, depends on boost level. Allows adjustable boost PSI setting, can be easily mount under the hood. PSI Level: Up To 30 PSi Boost 1 x Turbo Oil Return / Feeding Line Kit: Brand New, Light Weight, High Quality Turbo Oil Feed + Return Drain Line Kit Combo. Fits all of our turbo kits that feature a turbocharger with a 5-bolt exhaust housing. This provides a simple starter solution for connecting your turbo's exhaust to your existing exhaust system. The pictured metal composite gasket is included! 4 Bolt Flange: Made of High Quality Mild Steel Durable Material Construction Prevents Warping Due To High Heat 4-Bolt Rectangular Shape 0.50 Thickness Flange Fits T3 2.50" X 2.00" Turbo/ Turbocharger Flange 100% Brand New. Professional Installation is Highly Recommended (No Instruction Included). Installation: Instruction is Not Included, Professional Installation is highly recommended. 1x 5 Bolt Turbo Downpipe. 1x Type-S Blow Off Valve. Universal Fit Most Car Models will require modification! Business time for the processing Saturday, Sunday and US Holiday does not Count! You will need Turbo Manifold, other accessories and modification to complete the Turbo Kit Project! 1 x Type-S Blow Off Valve: Brand New, Light Weight, High Quality CNC Billet Aluminum Type RS Style Blow off Valve. Universal Fit Most Car Models (Please check with your turbo installer for detail). Handle : Usually takes 24 48 hrs. Business time for the processing Saturday, Sunday and US Holiday does not Count! Powered by Solid Commerce The All-in-One Listing, Inventory & Order Management Solution. The item "JDM Upgrade Stage3 Universal T3/T4 T04E Hybrid Turbo Kit Turbo Starter Kit 350HP" is in sale since Sunday, June 16, 2013. This item is in the category "eBay Motors\Parts & Accessories\Car & Truck Parts\Turbos, Nitrous, Superchargers\Turbo Chargers & Parts". The seller is "buyaparts" and is located in Rowland Heights, California. This item can be shipped worldwide.